I will be participating in a group show at the Kirkland Arts Center called False Proof(curated by Cable Griffith). 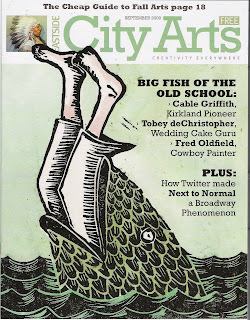 The people at City Arts were nice and put this painted linocut I did for the show on the cover of the magazine. The opening night will be September 10th and it will be up until October. I have created an entire room full of ephemera, skeletons, creatures, teeth, records, books, maps, listening devices, film, projections, slides, transparencies, cameras, prints, posters, charts, graphs, illustrations, paintings, harpoons, scrimshaw, pipes, instruments and possibly a short documentary all about my search for and obsession with the Elliot Bay Sea Beast. Or the Devilfish of the Northwest. Or the Creature Science Forgot. 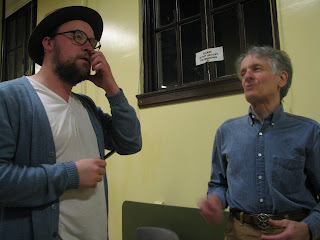 I had the pleasure of meeting Mr. Seeger and seeing him perform. He was an extraordinarily sweet man with a great handshake. 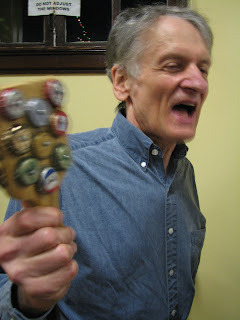 Mike Seeger (August 15, 1933 – August 7, 2009) was an American folk musician and folklorist. He was a distinctive singer and an accomplished musician who played autoharp, banjo, fiddle, dulcimer, guitar, mouth harp, mandolin, and dobro. Seeger, a half-brother of Pete Seeger, produced more than 30 documentary recordings, and performed in more than 40 other recordings. He desired to make known the caretakers of culture that inspired and taught him. He was also a founding member of The New Lost City Ramblers. "He was the supreme archetype [of the folk musician]. He could push a stake through Dracula's black heart. He was the romantic, egalitarian and revolutionary type all at once." He was poisoned by the Chinese and survived. He was my roommate for 16 years. He slept in my bed when I was gone. He would only sleep with a pillow. He liked steak and chicken. He hated vegetables. He hated Fourth Of July. He had good taste. Inspired by a couple of photographs from one of the books by Lloyd Kahn. I can't remember which book it was in though. 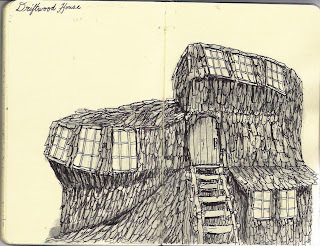 I think it was either Home Work or Shelter. Yuri Norstein or Yuri Norshtein (born September 15, 1941) is an award-winning Russian animator best known for his animated shorts, Hedgehog in the Fog and Tale of Tales. Since 1981 he has been working on a feature film called The Overcoat, based on the short story by Nikolai Gogol of the same name. 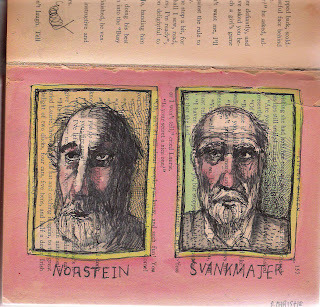 Jan Švankmajer (born 4 September 1934, Prague) is a Czech surrealist artist. His work spans several media. He is known for his surreal animations and features, which have greatly influenced other artists such as Tim Burton, Terry Gilliam, The Brothers Quay and many others.